David Wallach was one of the barter industry’s finest leaders and visionaries. David Wallach served as IRTA’s President from September 2007 until March of 2011 when the IRTA Global Board of Directors unanimously named him the first President Emeritus of IRTA. David’s contributions to the barter industry and IRTA spanned some thirty plus years. David Wallach’s passion and love for the barter industry was unprecedented. He selflessly spent thousands of hours every year building the barter industry because he truly believed that the benefits of barter could improve the standard of living of everyone throughout the world. The very phrase “modern trade and barter industry” was created by David Wallach. Prior to Dave’s barter career he served eight years in the U.S. Air Force, and as a private investigator for Marin County, CA. He later jumped into entrepreneurship by launching a chain of vacuum cleaning stores. In 1979 he formed the American Trade Association and grew it to become one of the largest and most successful barter exchanges in the U.S. After Dave sold his barter exchange, rather kicking back and enjoying the fruits of his labors, Dave re-dedicated himself to the barter industry by getting heavily involved in IRTA, and he maintained that level of commitment to IRTA to his last day. Dave also loved fishing in Montana, golf, collecting, travel and a good poker game and a great joke. David Wallach loved life to its fullest, he touched the lives of many people in a truly meaningful way and he was a treasure to all who knew him. IRTA’s David Wallach Outstanding Achievement Award recognizes rare, unselfish and passionate commitment to the barter industry. The kind of selfless commitment that David Wallach exhibited everyday. A 31-year veteran of the barter industry, Mary Ellen Rosinski has unselfishly devoted every one of those years to helping IRTA and the industry grow. She has done so with the utmost dignity, professionalism, class, and good humor. Mary Ellen is a tremendous asset to our industry and is a well-deserving recipient of this year’s prestigious David Wallach Outstanding Achievement Award. Mary Ellen co-founded Tradesource, Inc. in 1987 and immediately became a member of IRTA. She has served on the IRTA Global Board of Directors for more than 25 years, was IRTA Treasurer for most of those years and also served as President and Vice President of the North American Board. She has served on numerous IRTA committees including the CTB, Marketing, Membership and Executive Committee. Her expert contributions to the Money Transmitter and Regulations Committee have been invaluable in helping produce a much needed industry clarification regarding trade dollars vs. crypto currencies. In addition, Mary Ellen has been honored with the IRTA Paul St. Martin Distinguished Service Award, the IRTA Outstanding Achievement and Barter Ambassador Award. She has led numerous seminars and discussion groups during industry conventions on marketing, accounting, 1099 reporting, PCI Compliance, and IRS Regulations. Mary Ellen is an advocate for free market currency and IRTA inclusiveness of qualifying industry members. A Certified Public Account, Mary Ellen graduated with honors from Arizona State University and started her career at the accounting firm Ernst and Young. Always willing to share her time and expertise with others in the industry, Mary Ellen has designed barter account systems and has helped several barter exchanges successfully abate non-matching TIN penalties. Scott has been a member of IRTA since 1982. He served on the IRTA Global Board of Directors for more than 20 years, was IRTA President for two terms and held all other Board officer positions for a least one term. Scott has been honored on three occasions with the highest award IRTA offers; the Paul St. Martin Distinguished Service Award. He has also received several IRTA Outstanding Achievement and Ambassador Awards as well as numerous awards from NATE. Always willing to share his expertise with others in the industry, Scott has led numerous Seminars and Discussion Groups during industry Conventions. He presently serves as the Chairperson of the Universal Currency Committee and in September of 2016 Scott was elected Co-Vice Chairman of the IRTA Global Board. Scott graduated from Georgia Tech in 1977 where he attended on a football scholarship and received his BA in Industrial Management. Terry has been in the barter industry for over 30 years. She has received two IRTA Paul St. Martin Distinguished Service Awards and an IRTA Outstanding Achievement Award. Terry served 12 years on the IRTA Global Board and several years on the IRTA North American Board. She has also served on numerous IRTA committees and the UC Board of Governors, when UC was formed in the late 1990’s. Terry played a key role in producing the IRTA Sales Training and Trade Brokering Manual. Carl Steinbrenner has been legal counsel to IRTA for 15+ years. He has advised IRTA and UC on the most complex issues facing the barter industry with unwavering dedication and professionalism. Carl has over 30 years of corporate and business legal experience and has represented business owners and executives in almost every industry and ranging in size from local start-up companies to international Fortune 100 corporations. Carl has been admitted to practice law in New York, Ohio, Michigan and Illinois. He is admitted to federal district court and federal bankruptcy court. Prior to founding Steinbrenner Law Offices in 2001, Carl was an attorney with one of the largest Western New York law firms focusing on business and corporate matters and transactions. Before being a private practice attorney, Carl was corporate counsel in the law departments of Bausch & Lomb Incorporated and Owens-Illinois, Inc., both global corporations operating throughout the United States and the world. His earlier experience includes being President of Seagate Alliance LLC, a regional healthcare purchasing organization, as well as directing the contracting activities at the University of Rochester. Carl received his Juris Doctor legal degree from the University of Notre Dame and his undergraduate degree from the University of Illinois. He also is a graduate of Salzburg College in Austria and the Goethe Institut in Germany. Carl is appointed by the Rochester City Council to its Ethics Board and serves as its chair. He is also active with the Rochester Cycling Alliance, the Rochester German community and German school of Rochester, the Corn Hill Neighbors Association, and the Steuben German Scholarship Fund. Ron has been in the barter industry since January of 1993, when he founded Delaware Barter Corp in Wilmington, Delaware, (DBC). Ron sold his interest in DBC in late 2007 and was immediately elected as Executive Director of IRTA, having served on the IRTA Global Board for two years. Ron is responsible for growing IRTA from a 33-member organization a thriving global association of over 100 members. 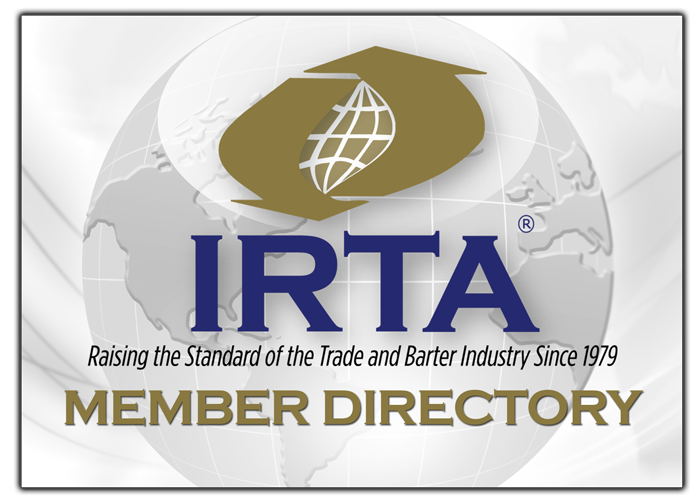 Ron has elevated IRTA presence and impact by moving IRTA to take meaningful advocacy positions on numerous critical issues related to the barter industry. Under Ron’s leadership trade volume in UC has more than doubled since 2007. Ron has received numerous IRTA awards, including the Paul St. Martin Distinguished Service Award and a Special Recognition Award from the IRTA Board in 2010 for implementing innovative and visionary programs into IRTA. Ron was appointed to IRS IRPAC Advisory Committee 2006 to 2009 and has positively impacted IRS policy regarding non-matching TIN penalties and 1099-B reporting. Ron has successfully orchestrated non-matching TIN penalty abatements for IRTA members in excess of half a million dollars. The IRTA Global Board modernized the IRTA bylaws in 2016 and appointed Ron IRTA’s President and CEO in September of 2016. Ron received a BA from George Washington University and a JD from the Delaware Law School of Widener University. Annette has over 25 years experience in the commercial barter sector. She transitioned into the community currency sector; she now operates a commercial barter exchange in Denver, CO., Community Connect Trade. Annette has received multiple IRTA Awards and is considered a worldwide expert in the Community Currency field. Annette served as President of IRTA from 2012 to 2016. She is an educator and valued speaker who has contributing her unique vision and commitment to all barter industry sectors; Retail Barter, Complementary Currencies, Corporate Barter and Counter-Trade. Annette traveled to Saudi Arabia twice in 2015 to further IRTA’s relationship with the International Islamic Trade Finance Corp. (ITFC) and was wrote the majority of IRTA’s December 22, 2015 Research Report for the Development of an OIC Multi-Dimensional Credit Clearing/Counter Trade System. Annette was elected as Co-Vice-Chairperson of the IRTA Global Board in September of 2016.